Deluxe comfort fit. 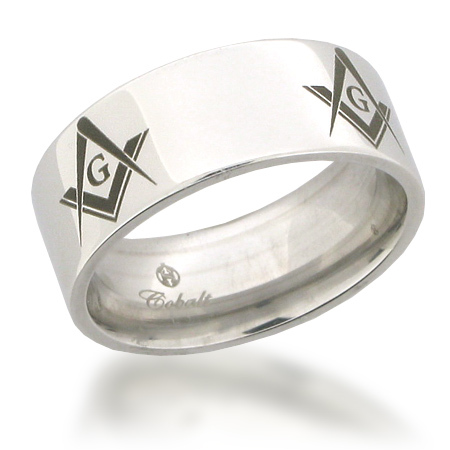 Four Masonic G Compass and Square logos laser engraved, every 90 degrees around this ring. This is the darkest laser engraved logo on a Masonic ring we carry. Polished finish, pipe cut band. Width: 8mm. Cobalt rings are made from a unique alloy blend that consists of cobalt and other substances to offer a bright white alternative metal. It will never need plating and is so white it is often compared to platinum in color. This metal is bio-inert, making it compatible to the body. Cobalt is commonly used in detistry and artificial joints because of its lighter weight and resistance to corrosion. Cobalt is harder than platinum with a scratch resistant surface. It will not break, shatter or chip thus providing extreme durability and wear. The luster and finish will not fade or tarnish in any way. Cobalt can be polished as you would a platinum ring. Beautiful ring! My husband loves it! Beautiful ring...My husband loves it! !